Studiometry 11 is finally here! For the first time in more than 10 years of business, we were late to release a major update of Studiometry. The reason for this was simple: Studiometry’s interface needed a huge overhaul, and we wanted to make sure we got it right. We’ve redesigned the UI from the ground up to make it cleaner, more intuitive, and easier to understand. We transitioned Studiometry for Mac to a Cocoa build, adding support for full screen mode, spellchecking, and much more. 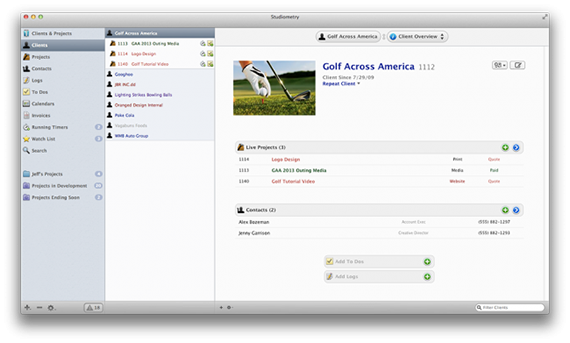 We’ve also added literally hundreds of new features and updates based on user feedback. Studiometry 11 is available today for download and purchase. New users as well as users of previous versions will get a free 30-day trial. Upgrades from Studiometry 10.x start at $59.95 USD per license, while upgrades from 9.x or older are $99.95 USD per license. 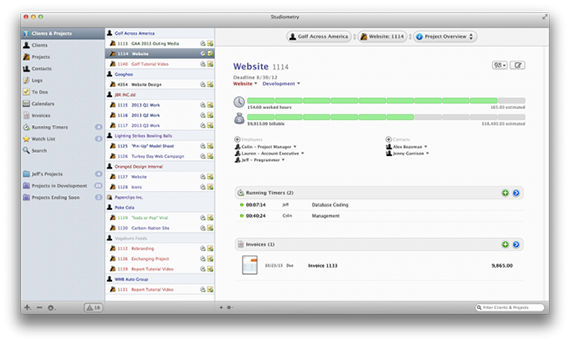 Studiometry 11’s interface was completely redesigned and rebuilt to be cleaner and more intuitive. We moved to a new three-column layout that makes navigating your data fast and effortless. The updated location bar makes it easier to visualize your current location in Studiometry and move between areas. New to Studiometry 11, customizable overviews let you instantly view a snapshot of information for a selected client or project. For example, now when you select a project, Studiometry can immediately show you the project’s budget chart, any incomplete to dos, and all associated invoices. You decide what information is shown and the order in which it appears. Mac version now built in Cocoa. Full screen mode, spellcheck, and OS X services are now possible in Studiometry. Custom Summaries have been completely rebuilt to be faster and produce cleaner output. Enhanced estimating functions have been added, such as the ability to invoice based on estimated work while still tracking actual work. On-the-fly summaries let you instantly create custom summaries focused on a specific client or project. The new running timers view includes filtering options and searchability as well as a cleaner overall look. Custom images can now be added to clients and projects. These will appear in the overview and can be used on invoices and reports. Visual invoice or report templates can now group items by project and include a header and footer for each. The watch list has been improved, cleaned up, and moved into the groups list for easy access. You can now add a default address and phone information for a client that will be used when creating invoices and reports for contacts without address information. Plus so much more! See the full version history.